which has originated in Spain has now been taken over by an Italian. This sauce may look...well, let's be honest...a little ordinary. However, I have been taught from a very early age that we can't judge until savoured. from the Spaniards and whipped an Italian version of my own. I feel I should not hide my embarrassing ignorance of sorts. 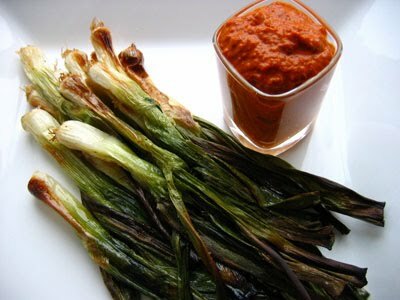 I had never heard of Romesco Sauce. Please note: this is not to be confused with ROManESCO sauce...which is an inventive name created by others. However, I've re-named it the ROMaSCO because I made pertinent changes to the original recipe. One day, I was flipping through a cooking magazine that mentioned this sauce. Can you imagine why I immediately assumed it was Italian?!? Did I ever mention how innocently insufferable I can be at times. To think...I sometimes accuse my Hubby of being Mr. Macho. Did I think the Italians had the proprietary stamp on any great tomato based sauce? Although, I did ponder on the fact of why I had never heard of it. No sooner did I 'google' it...I got a real chunk of humble pie. Now, I was curious and determined to try this incredibly versatile sauce. I was already picking and choosing what I didn't like. So much for respecting the typical Spanish cuisine. some sort of pesto sauce was going to be whipped up that evening. my tomatoes were already roasted and waiting for me to use. * Refer to this post...for easy instructions on roasting tomatoes.
. Roast the hazelnuts for about 12 minutes. Same applies for the almonds, although add 1-2 minutes. The hazelnut skin can be rubbed off partially with the aid of a tea towel. *** Ajvar: product from Turkey: It is simply a blend of finely pureed roasted peppers, eggplants, vinegar, sunflower oil, garlic, a touch of sugar and a tinch of hot pepper...and the bonus...no additives or preservatives. I kept coming up with excuses to use it again and again.
. Spread it as a base on pizza (as shown here on middle eastern pita bread).
. Make a 'bruschetta' type appetizer with a sprinkle of mild cheese.
. Slather on as a sandwich...or simply eat it with a slice of crusty bread. Greek style yogurt (strained regular 2% fat yogurt gives amazing results also).
. Use as filling to appetizers as shown in these 'Tostitos' corn taco scoops.
. Accompaniment to chicken or other type meats.
. Scoop over grilled veggies...especially potatoes. Even better to blend it into mashed potatoes. to smoothen the sauce...add Parmesan to taste. Notice...not much red here...just a few spoons of the pesto left over...I was desperate.
. Great as a filler for homemade ravioli.
. Mix in a few spoons into a soup or stew.
. Used especially to spoon over fish...is just sublime. I do hope you have a chance to blend up all this tasty goodness. I can assure you...that this will certainly become a go to pesto.